Article pionnier de Susana Bloch proposant une approche neuroscientifique des affects et émotions à l'œuvre dans l'apprentissage de l'acteur. Il est suivi de réponses de spécialistes de différentes disciplines qui commentent et prolongent cette analyse. Résumé en anglais : The contention that the execution of the effector pattern of an emotion initiates the corresponding subjective activation (feeling), presumably by a feedback mechanism, had been previously proposed (Bloch & Santibañez-H, 1972). In the present study, we report a method for expressing emotions, based on our findings. Actors were trained to perform the respiratory-postural-facial effector patterns of the basic emotions of happiness, sadness, anger, fear, eroticism and tenderness with different degrees of intensity and in different combinations. The learning and systematic repetition of these patterns allowed the actors to bypass the subjective activation which occurs at the beginning. Since the trained patterns correspond to the actual effectors involved during ‘real-life’ emotions, their correct execution is sufficient to convey the corresponding emotional meaning to the observer. A precise technique for ‘stepping out’ of an emotion was developed, which contributes to the subject's psychological balance and may find application in psychotherapy. The entire procedure results in a powerful method for training the expression of emotional behaviours at will in a controlled, graded and organic manner. It turns out to be particularly useful for actors. Pradier, Jean-Marie; Ekman, Paul; Muñoz Orellana, Horacio et all (Commentaires). 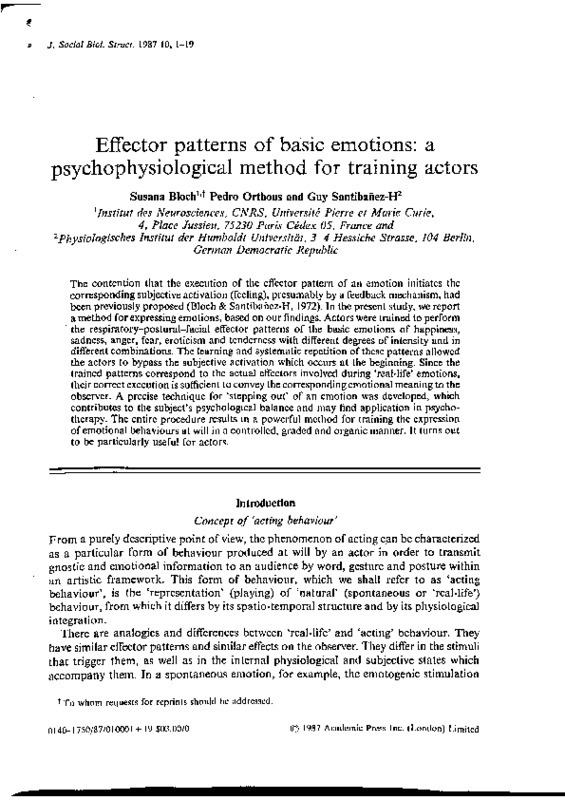 Bloch, Susana ; Orthous, Pedro ; Santibañez-H, Guy, “Effector patterns of basic emotions : a psychophysiological method for training actors,” SKEN@S, consulté le 23 avril 2019, http://skenos.mshparisnord.fr/items/show/348.